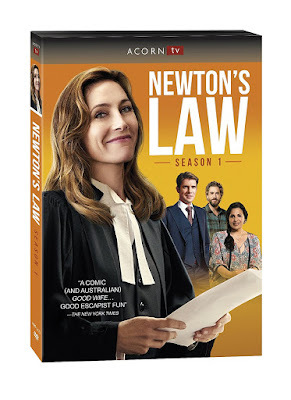 From the team behind one of Australia’s most successful series in Miss Fisher’s Murder Mysteries, the new Aussie legal dramedy NEWTON’S LAW debuts on DVD on March 6, 2018 from Acorn TV, an RLJ Entertainment, Inc. (NASDAQ: RLJE) brand. Fast-paced and sparkling with wit, Newton’s Law centers around a suburban solicitor (award-winning Aussie actress Claudia Karvan, Jack Irish, co-creator of The Heart Guy) who attempts to return to her briefly glorious career at the Bar. The DVD 3-Disc Set features 8 episodes, plus bonus behind-the-scenes featurettes and cast interviews ($49.99, Amazon.com). Newton’s Law made its exclusive U.S. premiere in September 2017 on Acorn TV. Called a “glorious streaming service… an essential must-have” (The Hollywood Reporter), Acorn TV is North America’s most popular streaming service focused on British and international television. When her offices are firebombed by an angry client, consulting solicitor Josephine Newton (Karvan) is forced to take a new job as a barrister at Knox, a high-powered legal firm where her old flame Lewis (Toby Schmitz, Black Sails) works. Worried about leaving behind her former clients turned colleagues, Josephine sets up a new legal office in the building’s basement for Johnny (Sean Keenan, Glitch), a reformed car thief, and Helena (Georgina Naidu, SeaChange), a brilliant legal mind with a crippling fear of courtrooms. As Josephine tackles high-profile cases with Lewis upstairs, she secretly consults with Helena and Johnny downstairs. Throw in a teenage daughter and a husband (Brett Tucker, The Americans) who doesn’t seem to understand the meaning of a trial separation, and Josephine’s new life is more hectic than ever. Funny and quirky,Newton’s Law provides “a welcome break from TV’s parade of dysfunctional antiheroes” (The Guardian). Josephine Newton is a consulting solicitor. After her office gets firebombed, she is forced to take on a new job as a barrister for a big law firm. But she's not willing to walk away from her old clients, so she opens up a mini office in the basement along with a reformed car thief and a brilliant lawyer who has social anxiety issues. Season 1 includes eight different episodes. Eternal Forces - A disgruntled client blows up Josephine's office. She takes former clients Johnny and Helena with her to a new job in a high powered law firm. The Butterfly Effect - Josephine's daughter gets arrested when her dad gets her involved in an environmental movement. She also takes on a case for a transgender teen. Control Theory - Josephine takes on a case for a women accused of killing her trainer. An insurance investigator also seeks help for her dad, but Josephine is afraid to take the case. Law of Cooling - One of Johnny's friends is accused of assault. Someone at the office tries to make trouble for the basement team. The Uncertainty Principle - An elderly volunteer is accused of kidnapping a Syrian asylum seeker. Callum needs help with an assault charge. Terminal Velocity - Lewis defends a kid accused of stealing sneakers. The guy who burned Josephine's office makes a reappearance. Equal & Opposite Forces - The team takes of a case for people who suffered side effects from a drug trail. This is another fantastic new series from Acorn. I love how they have so many shows where women take on the primary roles. This one is packed with intrigue and adventure, but also a lot of laughs. It's fun watching a legal show that doesn't take itself too seriously, and has some fun, quirky characters. I'm excited to see what happens in season 2. You can grab a copy of this wonderful DVD set for yourself online on Acorn Media or on Amazon.